Check out the Canon’s Camera Room for Rio Olympics 2016. Olympics is the biggest sporting event on planet earth. The athletes and players compete for the piece of shiny metal through numerous events, just like professional photographers looking to capture the decisive moment to the best of their ability and gear. A sporting event of this magnitude needs a whole lot of photography gear and backups. This event is also an opportunity for the top camera and lens manufacturers to showcase the ability of their latest camera gear and advances in the technology. 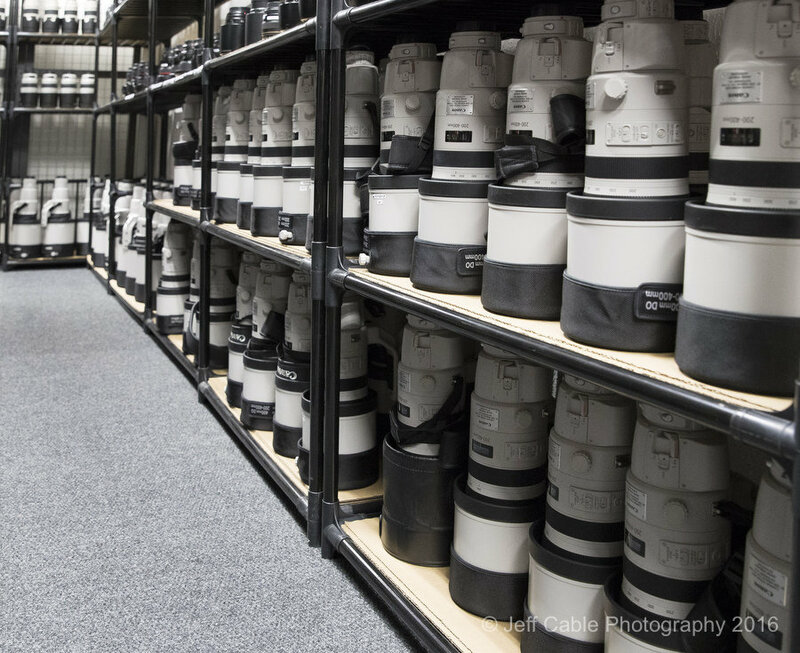 Canon’s Camera Room for Rio Olympics 2016 is a huge stockpile of Canon gear. Getty Images Sport showed how much gear they need for an sporting event like Olympics. But this was nothing compared to the stockpile of Canon’s arsenal of gears. Canon said that the company has brought over 1,500 lenses and over 950 DSLR bodies to the Rio Olympic Games. The Canon Professional Services (CPS) Depot at the games is a room filled from floor to ceiling with the Canon cameras, lenses, and accessories. Canon also has a staff or 78 professionals on hand to support the professional Canon photographers covering the Games. Each Getty Images photographer will be equipped with a nearly 50-pound camera bag that contains: a 360-degree camera, 4 DSLRs, a 16-35mm f/2.8, a 24-70mm f/2.8, a 70-200mm f/2.8, a 300mm f/2.8, an additional telephoto lens (400mm, 500mm, or 600mm), 2 flash units, a laptop, and clothes. This means that each photographer is carrying up to $42,289 in Canon gear in their 50lb bag when covering one of the sporting events.Getty Images will also be using special cameras for immersive 360-degree views and 20 robotic cameras for aerial and underwater views. 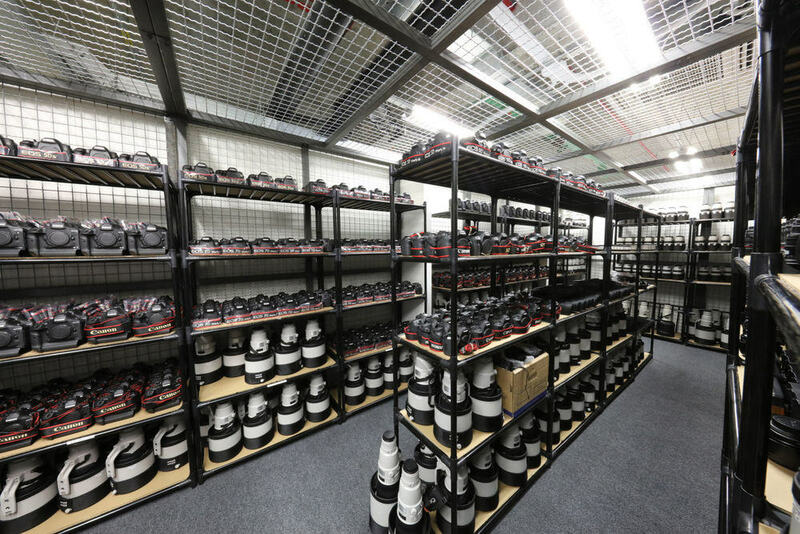 Take a look inside the room where Canon is storing the gears for Rio Olympics 2016.
Who would not like to be here! Canon will be lending these gear to the major photo agencies while on-site through the Canon Professional Services program, including Getty, Reuters, and the European Pressphoto Agency and others. Canon’s team of over 70 highly trained technicians and support staff will be in Brazil for nearly a month to support professional photographers and broadcasters, Canon said in a press release. The Canon EOS-1D X Mark II DSLR camera and ultra-wide zoom EF 11-24mm f/4L USM lens were selected to be used for Getty Images’ new high-tech, remote-controlled underwater robotic system. These two photos of Canon’s stockpile room were shot on a 14mm lens. Oh Dear! That is a serious lot. The other side looks same. Now all we need is a look inside the Nikon’s storage room for it’s Camera Gear. We are sure that would be no less than that of Canon’s. If this does not satisfy your gearohlic senses then check out the biggest lenses here and the most expensive lenses here. There will be multiple opportunities to make historic photographs at Rio 2016 and we are sure the professionals are raring for it.